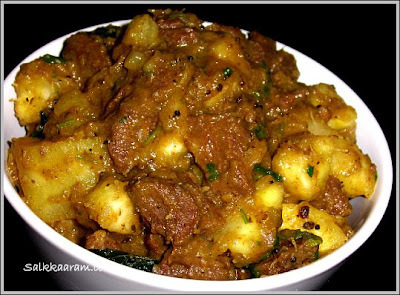 Kappa Beef Ularthu / Tapioca Biryani | Simple and Delicious ! Cut kappa / tapioca into small pieces . Clean and boil tapioca with salt and enough water. Drain water. Grind garlic and ginger to a paste. Wash and cook beef with chopped onion, tomato, garlic and ginger paste, crushed pepper corns, salt and all the powders.Reduce water to make a thick gravy. Heat oil, saute chopped shallots / chuvannulli, add curry leaves, slit green chillies and the thick beef curry. Add cooked tapioca and coriander leaves and mix well.Remove from fire and keep covered for a while. Oh I love this. Everytime i come here i am always taken to my childhood period. This looks really good Seena. 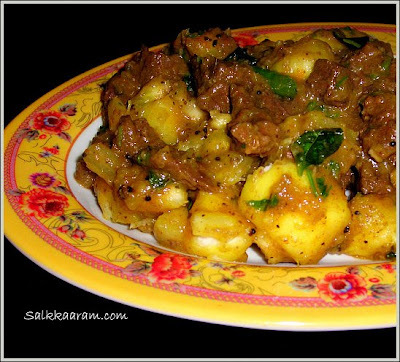 Makes me wanna go back to mom's house right away, though its been ages since I had beef!!! Hi Seena this looks so good! I bet it would be delicious with potatoes instead of kappa, I can not get tapioca root here. Beef naadan aale? ?I can imagine the taste of that dish..One of my favourite dish. I don't eat beef. can I try this with chicken. Does it taste good with chicken? Love the recipe . Wanna try this sometime with chicken. Thank you for this fabulous dish and great idea. I must try it sometime. How many people will this recipe serve?I want to make this for 4 ppl. hi seena,thanks for this recipe.it is very tasty.